Home / Resources / What is PDF accessibility? Only PDF is truly synonymous with “electronic documents” because only PDF was designed from scratch with key characteristics that set it aside from any other format and led to PDF becoming ubiquitous. 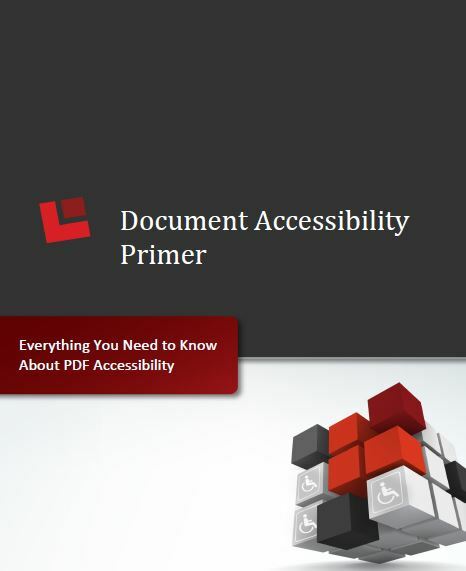 In order to understand how to make PDF documents accessible, you first need to understand how documents are “read” by screen reader technology. Screen readers such as JAWS and NVDA are used by blind or visually impaired computer users to navigate and read text on a screen. These tools have become more sophisticated in recent years and when accessing websites and programs that are properly designed to work with screen readers, blind computer users can fully utilize computers in the same way that sighted users access web content and applications. Current and Future Accessibility Standards In the U.S. and in the rest of the world, the accessibility laws and regulations are changing and becoming stricter in both requirements and penalties for non-compliance. W3C Web Content Accessibility Guidelines (WCAG) 2.0 http://www.w3.org/TR/WCAG/ WCAG 2.0 (ISO/IEC 40500) is the accepted international standard for web content accessibility, defining testable success criteria at levels A, AA, and AAA, with A being the most basic. Most countries base their accessibility standards on WCAG 2.0. W3C also publishes nonnormative techniques, including PDF-specific techniques to assist developers and content authors achieve conformance.